Map of southern Sudan showing the Mankien study site (from Ngondi et al., 2006 ). A bronze study of a blind man led by a young boy (R. T. Wallen). Reproductions of this statue are located at the World Bank and at the WHO. Photo by Julie Ost. 1. Allen SK ,, Semba RD . 2002. The trachoma menace in the United States, 1897–1960. Surv Ophthalmol 47: 500– 509. 2. Amazigo U ,, Noma M ,, Bump J ,, Benton B ,, Liese B ,, Yameogo L ,, Zoure H ,, Seketeli A ,. 2006. Onchocerciasis, p 215–222. In Jamison DT ,, Feachem RG ,, Makgoba MW ,, Bos ER ,, Bingana FK ,, Hofman KJ ,, Rogo KO (ed), Disease and Mortality in Sub-Saharan Africa, 2nd ed. World Bank, Washington, DC. 3. Amazigo UO ,, Obikeze DS . 1992. Socio-cultural factors associated with the prevalence and intensity of onchocerciasis and onchodermatitis among adolescent girls in rural Nigeria. WHO/TDR final project report. World Health Organization, Geneva, Switzerland. 4. Basáñez MG ,, Pion SD ,, Churcher TS ,, Breitling LP ,, Little MP ,, Boussinesq M . 2006. River blindness: a success story under threat? PLoS Med 3: e371. 5. Blackburn BG ,, Eigege A ,, Gotau H ,, Gerlong G ,, Miri E ,, Hawley WA ,, Mathieu E ,, Richards F . 2006. Successful integration of insecticide-treated bed net distribution with mass drug administration in Central Nigeria. Am J Trop Med Hyg 75: 650– 655. 6. Boatin BA ,, Richard FO . 2006. Control of onchocerciasis. Adv Parasitol 61: 349– 394. 7. Buchan J . 2006. Visual loss in postconflict southern Sudan. PLoS Med 3: e450. 8. Cobb Jr. C 2001. Africa: elimination of river blindness “possible within ten years.” All-Africa. December 14, 2001. http://allafrica.com/stories/200112150001.html. 9. Courtright P ,, Kim SH ,, Lee HS ,, Lewallen S . 1997. Excess mortality associated with blindness in leprosy patients in Korea. Lepr Rev 68: 326– 330. 10. Cupp EW ,, Sauerbrey M ,, Richards F . 2011. Elimination of human onchocerciasis: history of progress and current feasibility using ivermectin (Mectizan®) monotherapy. Acta Trop 120( Suppl 1): S100– S108. 11. Dandona L ,, Dandona R . 2006. What is the global burden of visual impairment. BMC Med 4: 6. 12. Diawara L ,, Traoré MO ,, Badji A ,, Bissan Y ,, Doumbia K ,, Goita SF ,, Konaté L ,, Mounkoro K ,, Sarr MD ,, Seck AF ,, Toé L ,, Tourée S ,, Remme JH . 2009. Feasibility of onchocerciasis elimination with ivermectin treatment in endemic foci in Africa: first evidence from studies in Mali and Senegal. PLoS Negl Trop Dis 3: e497. 13. Frick KD ,, Basilion EV ,, Hanson CL ,, Colchero MA . 2003a. Estimating the burden and economic impact of trachomatous visual loss. Ophthalmic Epidemiol 10: 121– 132. 14. Frick KD ,, Hanson CL ,, Jacobson GA . 2003b. Global burden of trachoma and economics of the disease. Am J Trop Med Hyg 69( 5 Suppl): 1– 10. 15. Geary TG . 2005. Ivermectin 20 years on: maturation of a wonder drug. Trends Parasitol 21: 530– 532. 16. Haddad D . 2012. Trachoma: the beginning of the end? Community Eye Health 25: 18. 17. Hotez PJ . 2007. Control and elimination of onchocerciasis—the next generation. Lancet 369: 1979– 1980. 18. Hotez P . 2011. Enlarging the “audacious goal”: elimination of the world's high prevalence neglected tropical diseases. Vaccine 29( Suppl 4): D104– D110. 19. International Trachoma Initiative. 2010. Zithromax® in the Elimination of Blinding Trachoma: a Program Manager's Guide. International Trachoma Initiative, Decatur, GA. http://trachoma.org/sites/default/files/guidesandmanuals/Zithromax%20 manager's%20guide.pdf. 20. Kale OO . 1998. Onchocerciasis: the burden of disease. Ann Trop Med Parasitol 92( Suppl 1): S101– S115. 21. Kasi PM ,, Gilani AI ,, Ahmad K ,, Janjua NZ . 2004. Blinding trachoma: a disease of poverty. PLoS Med 1: e44. 22. Levine R , What Works Working Group. 2004. Millions Saved: Proven Successes in Global Health. Center for Global Development, Washington, DC. 23. Mackenzie CD ,, Homeida MM ,, Hopkins AD ,, Lawrence JC . 2012. Elimination of onchocerciasis from Africa: possible? Trends Parasitol 28: 16– 22. 24. McGavin DDM ,. 2002. Ophthalmology in the tropics and subtropics, p 301–362. In Cook GC ,, Zumla AI (ed), Manson's Tropical Diseases, 21st ed. W. B. Saunders, New York, NY. 25. Ngondi J ,, Ole-Sempele F ,, Onsarigo A ,, Matende I ,, Baba S ,, Reacher M ,, Matthews F ,, Brayne C ,, Emerson PM . 2006. Prevalence and causes of blindness and low vision in southern Sudan. PLoS Med 3: e477. 26. Osei-Atweneboana MY ,, Eng JK ,, Boakye DA ,, Gyapong JO ,, Prichard RK . 2007. Prevalence and intensity of Onchocerca volvulus infection and efficacy of ivermectin in endemic communities in Ghana: a two-phase epidemiological study. Lancet 369: 2021– 2029. 27. Rearwin DT ,, Tang JH ,, Hughes JW . 1997. Causes of blindness among Navajo Indians: an update. J Am Optom Assoc 68: 511– 517. 28. Rodríguez-Pérez MA ,, Unnasch TR ,, Real-Najarro O . 2011. Assessment and monitoring of onchocerciasis in Latin America. Adv Parasitol 77: 175– 226. 29. Simonsen PE ,. 2002. Filariases, p 1487–1526. In Cook GC ,, Zumla AI (ed), Manson's Tropical Diseases, 21st ed. W. B. Saunders, New York, NY. 30. Smith JL ,, Haddad D ,, Polack S ,, Harding-Esch EM ,, Hooper PJ ,, Mabey DC ,, Solomon AW ,, Brooker S . 2011. 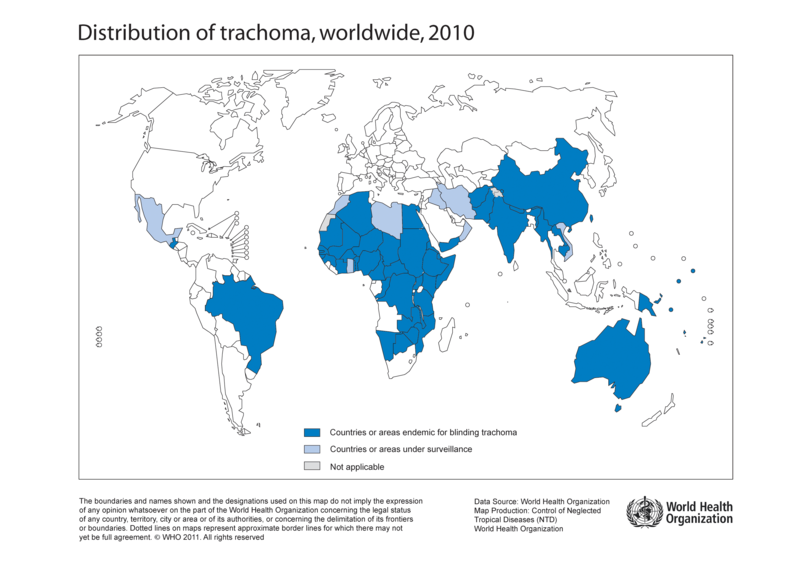 Mapping the global distribution of trachoma: why an updated atlas is needed. PLoS Negl Trop Dis 5: e973. 31. Taylor MJ ,, Bandi C ,, Hoerauf A . 2005. Wolbachia bacterial endosymbionts of filarial nematodes. Adv Parasitol 60: 247– 286. 32. Vlassoff C ,, Weiss M ,, Ovuga EB ,, Eneanya C ,, Nwel PT ,, Babalola SS ,, Awedoba AK ,, Theophilus B ,, Cofie P ,, Shetabj P . 2000. Gender and the stigma of onchocercal skin disease in Africa. Soc Sci Med 50: 1353– 1368. 33. World Health Organization. 1995. Expert committee on onchocerciasis control. Technical report series no. 852. World Health Organization, Geneva, Switzerland. 34. World Health Organization. 2012a. Visual impairment and blindness. Fact sheet no. 282. June 2012. World Health Organization, Geneva, Switzerland. www.who.int/mediacentre/factsheets/fs282/en/. 35. World Health Organization. 2012b. Global WHO Alliance for the Elimination of Blinding Trachoma by 2020. Wkly Epidemiol Rec 87: 161– 168.